Most of my dreams are unpleasant. I don’t know if I’m alone in that because, frankly, I don’t want to know. Yet, I suspect that like a lot of people my brain goes to work at night trying to find solutions to the conflicts and confrontations we experience during the day. For those of you who don’t know me, I’m a math teacher in an urban school setting, so I live, eat, drink, and breathe the pressure that comes with public school education every day. Naturally, some of that stress spills over into my sleep. These dreams, the ones I long for, these rare respites from thistles and thorns aren’t unconnected. Weird, right? I don’t mean that I will have continuing dreams several nights in a row, although I wish “wonder” would visit me that often. It’s stranger than that. Years, sometimes many years, will go by and a long-forgotten dream will come back to me and pick up where it left off, like a favorite college-friend who drops in on your doorstep unexpectedly to say hello. I had one of these sublime visitations last night, which is why I’m writing about it. My amazement and longing is still so fresh, I doubt if I could write about anything else. 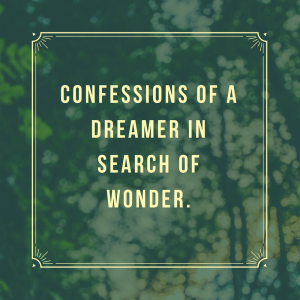 What fills me with wonder? That the answer is surprising to me perhaps reveals how little I know myself, but to understand last night’s dream, I will have to relate the details of its predecessor. I find myself in a library. It’s not overly large and certainly not modern. There are no computer stations and there are all these old-fashioned card files to help the patrons find their books. The shelves are hardwood and they lacquer on them is dark with age. Though well-lit, the library has a bit of a dusty smell and the books are all hard-bound copies and the binding is the heavy duty type with embedded fabric without ornamentation. Only the titles are on the cover. I love libraries, especially one with hardbacks and I’m browsing through the shelves when I find a series of thick books in my favorite genre by an author I’ve never heard of before. I pick up the first book in the series and I start to read. The story is perfect. I’m so overwhelmed by it that I’m completely captivated. Not only does the story enthrall me, it gets inside of me. It makes me a better person. It’s literally the perfect story. I’ve lived and breathed fantasy for years. Why haven’t I heard of this story and this author before? Here I am, holding in my hands huge volumes of the best writing I’ve ever read and I’ve never even heard mention of the author. I sit on the floor, so lost in the writing that I don’t want to move, half-afraid the books might vanish. Now, understand, this dream came to me decades ago, but last night I got the sequel. I’m wandering in the countryside. I live in Tennessee so there are a lot of places even close to Nashville that are half-a-breath away from being completely rural. For some reason in this dream I’m walking and I come upon a hollow. For those of you who don’t speak the southern vernacular, a hollow is the fold between two hills. Unless you go right up and into the crevice in the land, you’d never see whether or not there’s a house there. I enter the hollow using a dirt road of southern red clay – there are hills all around – and I see a house. When I look at the mailbox, I realize it’s the home of the author of these amazing books. He lives here! I’ve stumbled on the home of the greatest fantasy author ever to set pen to paper. It doesn’t matter that he’s not home. It’s the middle of the day and I know he’ll be back before long. I settle myself to wait for the man who wrote the story that got inside of me and filled me with wonder on every page. And that, fortunately or otherwise, is where the dream ended. I don’t know what the author looks like. I don’t know if he’s a nice old man or curmudgeonly with age. I only know that I’m filled with wonder and longing this morning. I’m also resisting the urge to interpret the dream. I have no desire to explain the points in both dreams and their obvious symbolism. They’ve worked their magic on me and I find myself unwilling to reduce my wonder to the level of prosaic explanations. However, I will say that I hope and pray you have a similar experience. I hope you get to read the perfect story and find the author, even if it’s just in your dreams. Patrick saw more of the world on his own through a varied and somewhat eclectic education and work history. 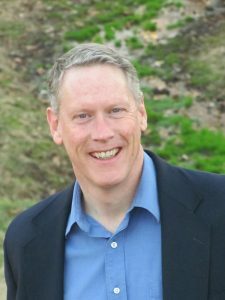 He graduated from Georgia Tech in 1984 and has worked as a draftsman at a nuclear plant, did design work for the Air Force, worked for a printing company, and consulted as an engineer. Patrick’s day gig for the last eight years has been teaching high school math in Nashville, TN. He currently makes his home in Nashville with his wonderfully patient wife, Mary, and four sons he thinks are amazing: Patrick, Connor, Daniel, and Ethan. Sometime in the future he would like to be a jazz pianist, and he wrestles with the complexity of improvisation on a daily basis. While Patrick enjoys reading about himself, he thinks writing about himself in the third person is kind of weird.